Post by the Hawthorne Hawkman, image from the Minneapolis Journal. Sure, it's nowhere near Christmas. It's not even July yet, so we have at least a few days before major retailers start putting Yuletide decorations out. 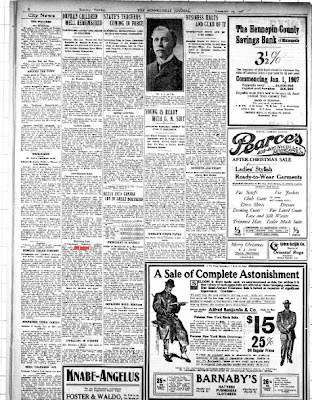 But a friend of mine sent me this link that tells a little bit more of the history of The Sheltering Arms House at 2648-2650 Emerson Ave N.
For newer readers, The Sheltering Arms House is a boarded and vacant fourplex that was purchased by the City of Minneapolis with the intention of demolition and land banking. Before that could happen, I did some research and found that the house was likely the first or second Sheltering Arms orphanage back in the 1800's, and was the precursor to the Sheltering Arms Foundation. Back when this was an orphanage, it was run by a board of twenty-five Episcopalian nuns, who were committed to serving orphaned children without regard to race, color or creed. Old fashioned Christmas customs were in vogue at the Sheltering Arms, 2650 Emerson Ave N, where thirty homeless children are tenderly cared for. Thirty stockings were hung up last night in gleeful anticipation and this morning there was a lively scramble all over the place. The tree celebration was planned for 3 o'clock this afternoon for which an interesting program had been arranged by the matron, Miss F.B. Hynes. 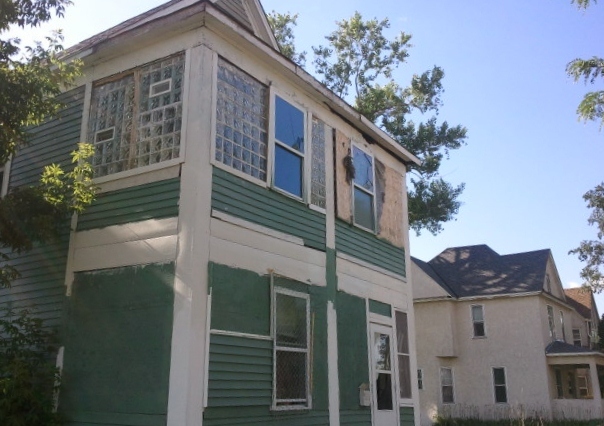 The Old Highland neighborhood and Preserve Minneapolis have joined forces with renowned preservationist Bob Yapp to put on a series of home rehab "boot camp" sessions over the next several days. Window Restoration Boot Camp started on Friday and lived up to its name. By the end of the day I was sore in places I didn't even know WERE places, and my mind was almost overloaded with the barrage of information that was thrown my way. Even so, I managed to break only one of the two panes of glass I handled, and gained a thorough working knowledge of how to use the shop-vac. In all seriousness, I did pick up quite a bit. However, you're reading a blog post from the guy who threw away his eighth grade shop project because he was too embarrassed to show it to the teacher. And that was a dustpan. I'm still a little slow on the uptake when it comes to such handiwork, but I'm no longer shy about the fact that it takes me longer than others to catch on. In fact, I feel like that's precisely why I want to attend sessions like this--so I can learn from someone like Bob Yapp. Post and photo by the Hawthorne Hawkman, sign made by Jordan neighbor Deb Wagner. 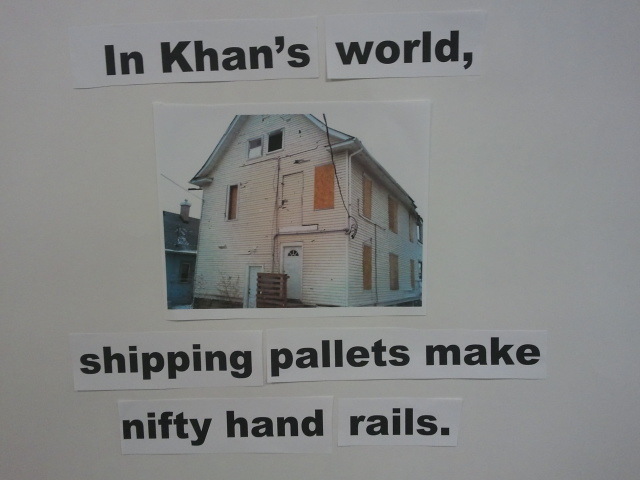 At today's City Council meeting, another Khan property was unanimously voted into a landfill. 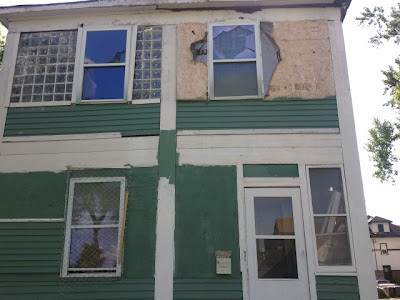 2639 Oliver Avenue North got the heave-ho, thanks in large part to dedicated Jordan residents who compiled video and photographic evidence of just how damaging a force Mahmood Khan is to north Minneapolis. Even though the agenda item was not up for public discussion, three of us sat through the meeting holding homemade signs reminding the Council how much this property needs to come down and how much we need strong action against slumlords like Khan. In a poetic twist, many of the signs were papered-over "We Buy Houses" sign spam. Just like Khan is known for placing used carpeting in his rentals, we reused items that should have been thrown away a long time ago. I hope our northside CMs realized that as staunch of an advocate for preservation as I am, if a house inspired me to take time off of work to go downtown and lobby for demolition, then this place must really need it. That being said, Khan has been fighting the demolition at 2222 4th St N for several years now, so who can say when the Oliver property will meet the backhoe of doom? On Tuesday, June 12, the Hennepin County Regional Railroad Authority held a meeting seeking public comments on the Bottineau LRT proposal. There's about sixteen different local government bodies that will weigh in on the merits of various aspects of the Bottineau line, and that's probably an understated number. The HCRRA is one such entity, which was created to plan, design, and implement light rail transit in Hennepin County. The commission is expected to take action on a locally preferred route at their June 26 meeting, and is accepting public comments until the end of the business day on June 18th. 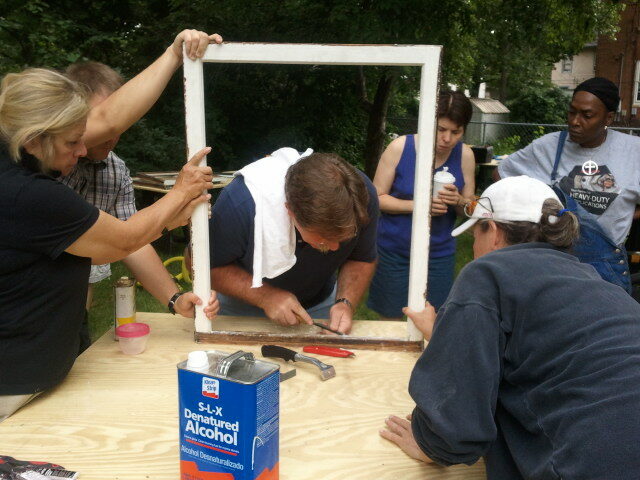 Plywood and Chicken Wire and Glass Block Windows, Oh My! Last week I wanted to see Mahmood Khan's dilapidation at 2639 Oliver so I could be certain it's as bad as everyone says (it is). I don't normally pick on random properties just for the heck of it. Instead, I try to focus on specific problem landlords or poorly done replacement windows. 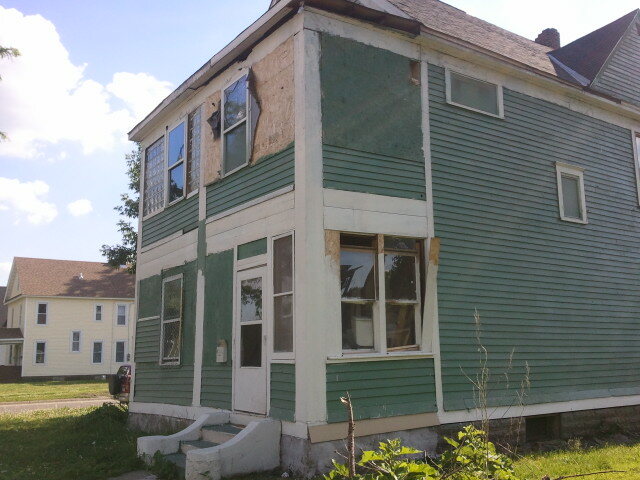 Every once in a while though, a house is in such an egregious state of disrepair that it just begs for a 311 report. And that's the case at 2701 Oliver Avenue North. Just look at it. How in the WORLD is something like that even permissible? Glass block windows are on the second floor, and even then, they aren't installed correctly. One segment is upside-down. Next to that is what I am generously calling a window, although it's broken and so is the plywood around it. This is also the first time I've seen chicken wire used in this way. Around the corner on the north side of the house are two windows that almost look like they could be repaired. But sometime recently, these windows became self-aware, realized they are in imminent danger as long as they are attached to this property, and have clearly been plotting their escape. Then we have the paint job, which looks like it was done by a four-year-old who wanted to prove to mommy and daddy that he doesn't always have to color inside the lines. This is one of the few properties that would be improved if Keith Reitman handled the painting. As I was snapping these photos, a tenant came up and asked what I was doing. I informed her in no uncertain terms that this house was in terrible condition and I was going to report it to 311. She said her landlord has been a good landlord, and that she hasn't had any problems with him. Now that's certainly interesting, because according to the city's website, Brandon Fischer and Kevin Owen don't have a rental license. The 311 report I filed mentions the apparent lack of a license, the numerous window problems, and the fact that there are no house numbers on the front of the property. At Saturday's Spring Green-Up event on West Broadway, I won the prize for the most metaphysical piece of litter picked up along the corridor. (It was a prize I made up on the spot and arbitrarily awarded myself, but I earned it.) 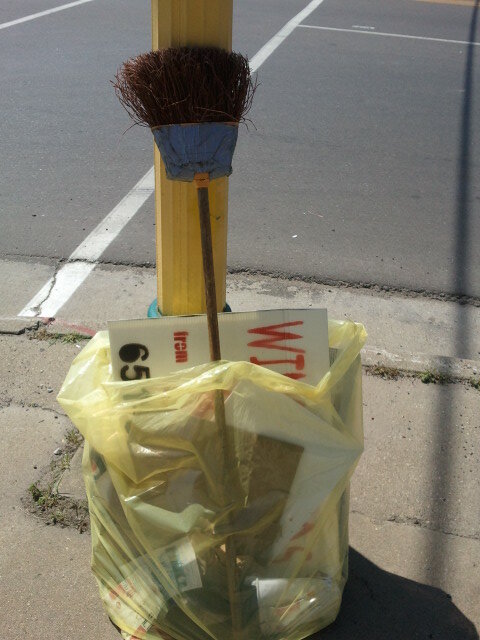 A broom was laying in the middle of the street along Broadway and Washington. So I used it to sweep up garbage AND knock down sign spam before putting it on a corner to be picked up later. Using litter to pick up litter and take down litter...my mind is collapsing in on itself!